Panama fosters a traveler’s sense of exploration. 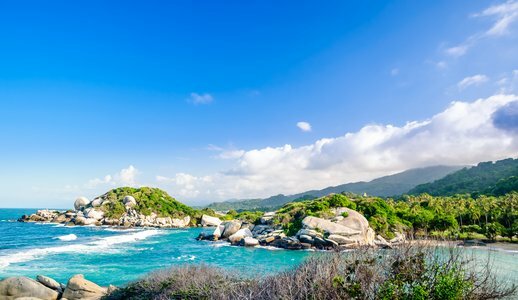 From trekking the rainforest, sailing from island to island, exploring the ruins of Spanish forts, and getting to know its unique culture, this country has the makings of a great adventure. Panama is a year-round destination, but many prefer to travel there during the driest season from mid-December to mid-April. Discover the classic destinations of Panama City and the Panama Canal, swim with colorful fish and lounge on the white sand beaches of the Archipielago de Bocas del Toro, visit the forested hills of the highlands, and fall in love with the colorful culture of the Peninsula de Azuero. Spend at least a week exploring Panama’s natural wonders and scenic highlights. Discover the colorful streets and magnificent beaches of Panama on this week-long, family-friendly trip. Spend a few days in Panama City, where you'll sail down the Panama Canal and explore the city's vibrant, historic neighborhoods. Then head to the Caribbean paradise of Bocas del Toro for beach time and wildlife encounters before ending your journey back in the capital. Melding colonial history and bold modernity, the cosmopolitan capital of Panama is a thriving hub in Central America. With this active weeklong itinerary, you'll explore the city's best neighborhoods, boat through the Panama Canal, and take day-trips to nearby national parks and indigenous villages. Finish with a ferry to the Pearl Islands in the Gulf of Panama for a dose of beachy relaxation. Panama is a beautiful country brimming with history and diversity, and this 7-day itinerary offers an exciting sampling of its many charms. You'll explore the capital, from its quaint colonial streets to its famous canal to its more modern attractions. Then venture out into the countryside, where you'll learn about the customs of indigenous locals, meet rainforest wildlife, and tour the Caribbean beach town of Portobelo. Harken back to the days when Panama was rich with colonial ports and pirate invasions on this 8-day itinerary. Starting in the capital, you’ll explore historic neighborhoods, see the Panama Canal by train, and visit ruins of a UNESCO-listed fort. Finish the trip with a catamaran ride in the same waters as the pirates once sailed. You’ll also hike in two national parks laden with exotic birds, monkeys, and tropical plants. Get ready for an active trip to an undiscovered region of Panama that combines beautiful landscapes, exuberant nature, and pleasant weather. On this 11-day multi-sport itinerary, you'll fly through a cloud forest, raft along a river, and trek up a volcano where you can witness two oceans from above before camping under the stars—an unforgettable experience! Ideal for hikers, birders, and lovers of wild nature, this off-the-beaten-path trek takes you to Darien National Park—an ecologically-diverse rainforest at the tip of Central America. In addition to rare species of flora and fauna, the region is full of history and native people who are happy to display their artistry and hospitality. Start and end the trip in cosmopolitan Panama City for a dose of urban culture.